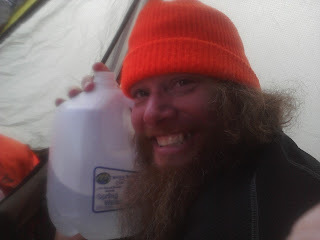 Thank you Tony for the water cache! It made our 1600ft climb today a lot easier knowing we'd have some water up top. Today was the kind of day that induced grinning. We were so happy to be moving again that the miles flew by. I Google-mapped this area extensively before leaving and so seeing it all in person is really fun. Also, the weather is amazing. I know it may be short lived, but it felt so good to take a long lunch break in the sun and be warm. Today's highlight: a lunchtime snowball fight. Probably a bad idea to get wet, but too much fun. I hit Bart in the face. ...oops? enjoying following your journey! mark S.